My background is in jewelry design, not construction. But once I decided to build my own home, I voraciously read every home design and building book that I thought might be relevant. It became my dream to build a home myself from raw materials. I have traveled to every continent, including Antarctica, so I got a firsthand view of different building styles and techniques. I particularly loved the rural, oak-framed homes in England that date back centuries. I based the style of my house on the traditional cob-and-thatch cottages of southwest England. Cob is similar to adobe in the U.S. Southwest, but contains a bit more straw and is built up while the layered mixture is still wet. 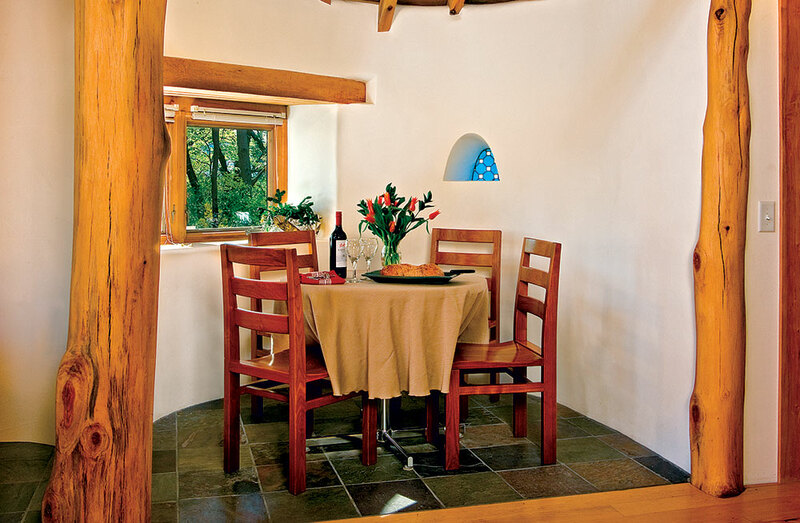 These cob-walled and thatch-roofed homes that inspired me also dovetailed nicely with my desire to build a home that was influenced by history but was contemporary in its energy efficiency and construction using natural materials. I chose straw-bale construction, which is coming back in vogue now but was 19th-century rural America’s answer to cob walls. The Nebraska plains pioneers simply used the materials available to them: lots of straw and very few, if any, timbers. People who walk or drive past my home see an English-style cottage. Most have no idea its walls are filled with straw or that its structure is made of big timbers erected in a post-and-beam layout. The posts define the space inside by separating the house essentially into three aisles that run the length of the house—a traditional European design for post and beam—so that the living room, kitchen and bedroom make up the large middle section on the main floor. To either side are the lesser aisles, one on the east side containing the piano nook, the foyer and the master bathroom. The other holds the sofa nook, the dining area, the pantry and the alcove for the bed. This frame layout dates back more than two millennia and can be seen in old houses, barns and churches. The large timber columns define the niche spaces of the side bays. The value of nooks and alcoves was one of the things I learned while reading my favorite book about home design, A Pattern Language, by Christopher Alexander. In a small house like mine, alcoves add a variety of intimate spaces without adding rooms that would in effect make it feel smaller. A dozen of the 24 round hardwood posts were cut from the building site, and the rest all came from less than 15 miles away. They were primarily red oak, with some cherry, maple and walnut as well. The taller posts of the inner row are 21 feet tall and run from the bottom of the lower level up to the rafters. The horizontal beams that support the loft, its 2-by-6 tongue-in-groove plank floor and the flooring on the main level are all maple cut from a wooded family plot in upstate New York. 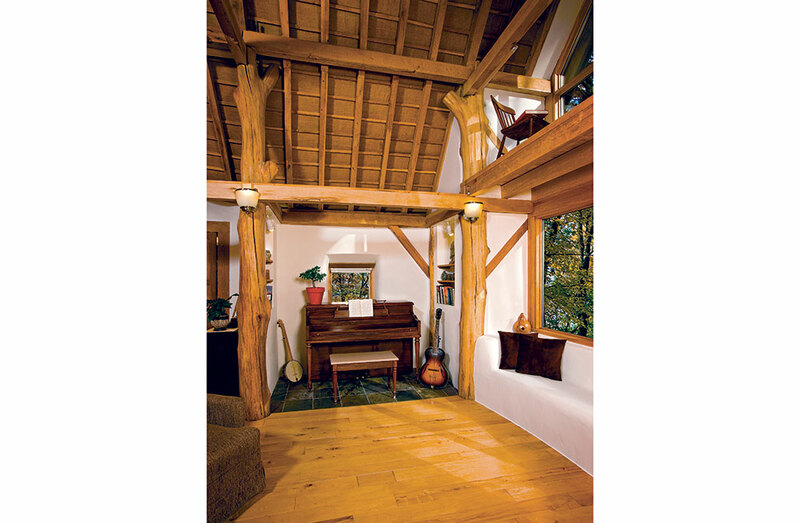 The roof structure was custom milled by a local sawyer and is primarily white oak, with cherry rafters in the loft bedroom. I had originally planned a thatched roof, but my plan ran into a host of hurdles it could not clear. The logistics of harvesting the correct grasses proved impossible. When I imported a 40-foot shipping container of thatch, it was stopped at the New York harbor because the Agriculture Department agents said it contained exotic plant diseases. Heat-treat it, destroy it or send it back, I was told. I sent it back, lost $6,500 and had to redesign the entire roof structure and insulation system. It is now built up 11 inches above the oak frame and filled with cellulose insulation. I hired some help on electric and plumbing but did most of the work myself. Since I had some experience operating machinery, I rented a mini-excavator and dug the foundation myself. I soon made connections with knowledgeable construction people who were invaluable with advice and tools. Each different skill needed to build a house can be learned. However, to learn all of them at once is daunting. My advice to others building their own home would be, at a minimum, to hire out electrical, plumbing and foundation work. My foundation consists of a concrete footer topped by a double concrete block wall, with vermiculite filling the cavity between the two walls. This wide base was necessary for the fieldstone stem wall between the foundation and the straw bales. The walls range from 18 inches to 24 inches thick. The fieldstone was generously donated by two farmers who live a few miles down the road. 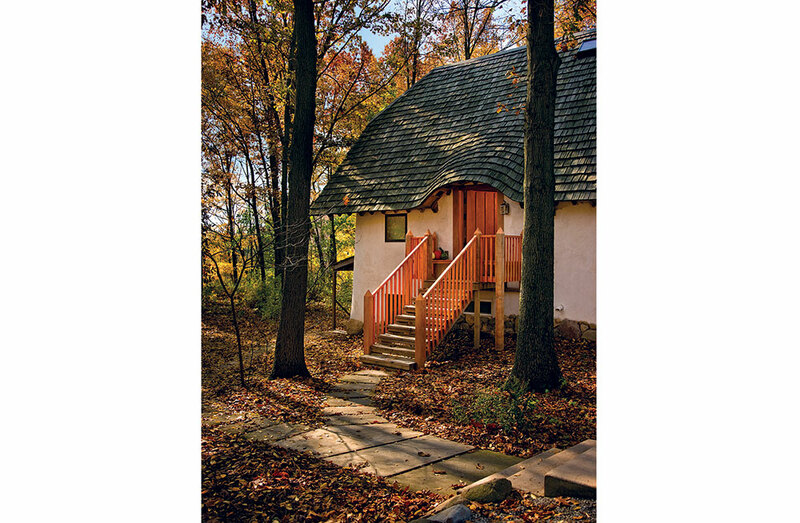 The roof is made of cedar shakes and capped with a copper ridge. The opening windows on the sides of the house are aluminum-clad, triple-pane from Pella’s Designer Series. I designed this house as a duplex so that I could rent the lower level to defray expenses. Duplexes are rarely seen in custom building literature, but this design decision allowed for two smaller separate dwelling spaces that share outside walls, a driveway and the utility infrastructure, making a more efficient building and minimizing expenses. Because of the tremendous thermal mass of the insulated foundation, the thick walls and the exposed timbers, on most winter evenings we can light the woodstove at dinnertime, burn it hot and then shut it down at midnight. The house will stay warm until the next evening. There is a backup radiant-heat system powered by an electric water heater, but it hasn’t been used for three years. We have Energy Star appliances, a gas stove and a tankless water heater, so our gas bills are only about $12 a month and our electrical bills are only about $40 a month, except in the coldest winter months, when we run a small heater in the bathroom, and the bills rise to about $65 a month. The upside to learning almost all aspects of construction is that for my next house, I will be able to design and build it myself. The satisfaction of crafting building elements from raw materials can’t be beat. Having crafted jewelry, I feel proud to show off the big jewel of a home that I made with my own hands—along with some help from many friends. I had never built a house before I started and had no idea what I was getting into. My jewelry background taught me how to start with an idea, add some raw materials and produce a finished product. But the difference in the tolerances of jewelry making and home building are huge. When setting a diamond, if you are off by a millimeter, you might as well be off by a mile. With the house, I let the rough finish add to its character. If I had applied a jeweler’s standards, I’d still be building it. 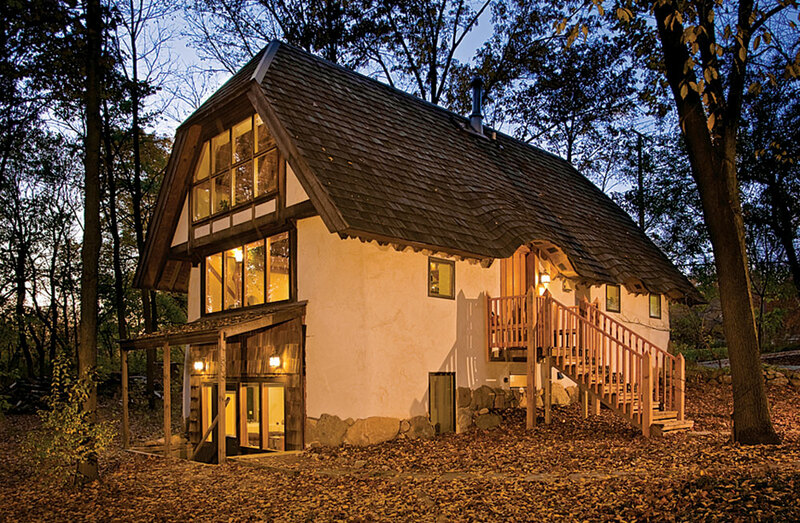 This cozy Indiana home built by Gregory Lehman — with straw bales inside the walls and with almost a foot of dense-packed cellulose insullation above the oak rafters — has incredibly low utility bills. Windows cover almost all of the two-story south wall in the main living area, letting the sun heat the house during the day. 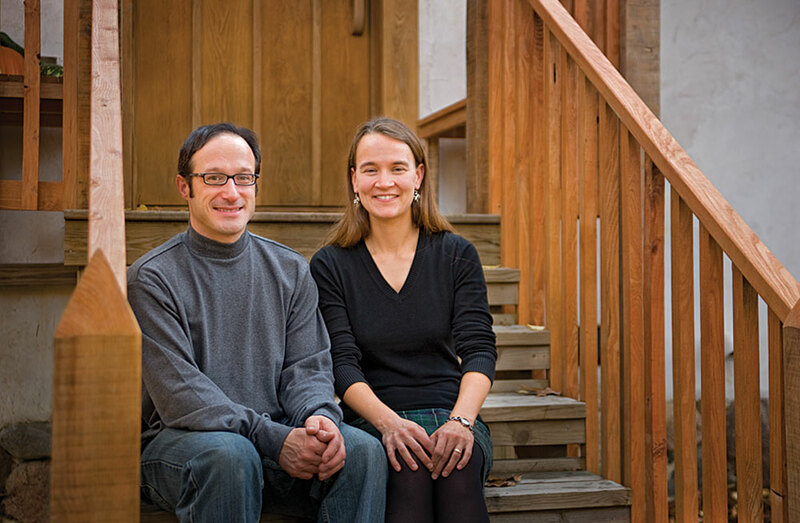 Greg (with wife, Karen) built this post-and-beam home using mostly materials from the site or nearby. He based the design on the cob-and-thatch timber homes of southwest England. 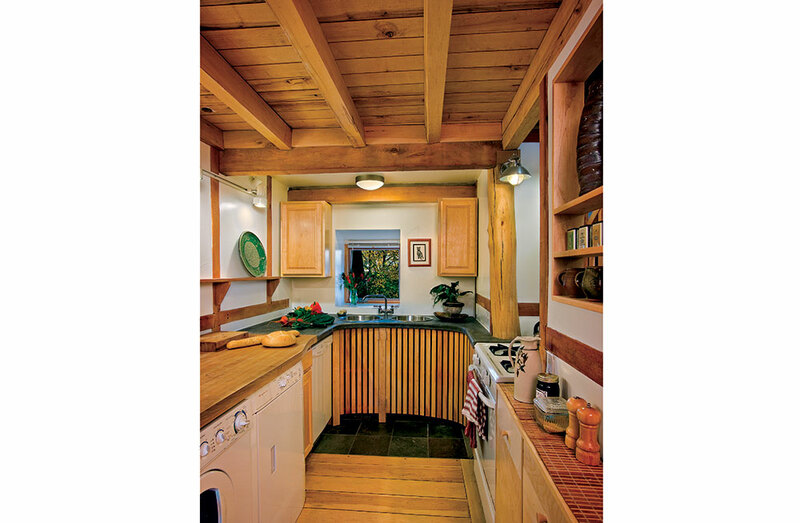 The kitchen runs through the entire width of the house from the east to the west wall. The maple cabinets are stock items from a home improvement center. The concrete countertop with charcoal dye was made by the homeowner. 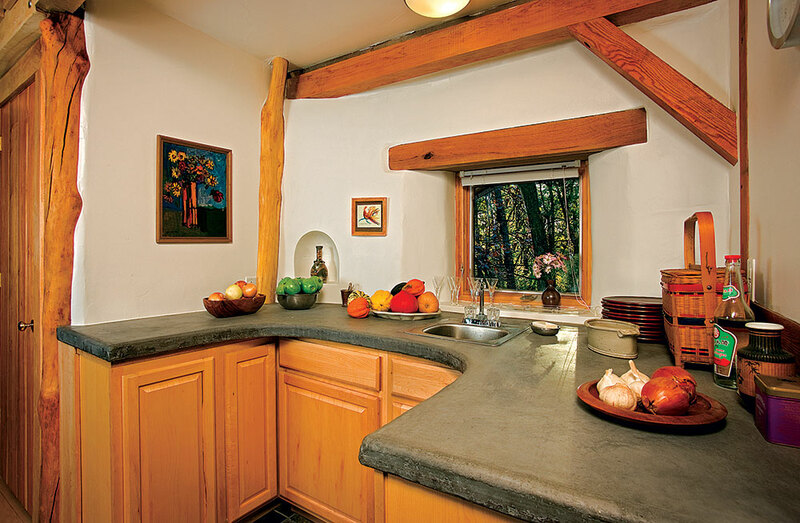 The alcove at the west end of the kitchen features a sink, several cabinets and one of the two concrete countertops. 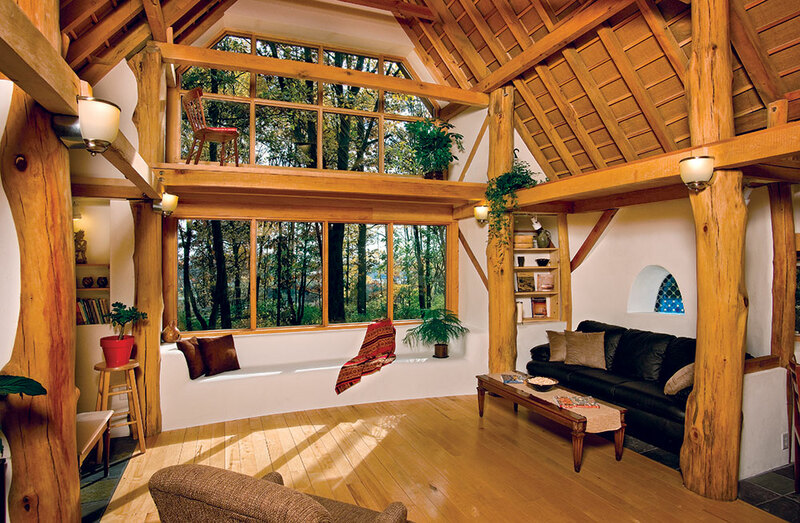 The windows in the thick walls of a straw-bale house are set to the outside wall, permitting inset window ledges. The posts that form the main structure create three aisle-like areas that run the length of the house: a large one in the middle and smaller ones on each side that create little room vignettes for dining, sitting or entertaining. The stained-glass was made by the homeowner. 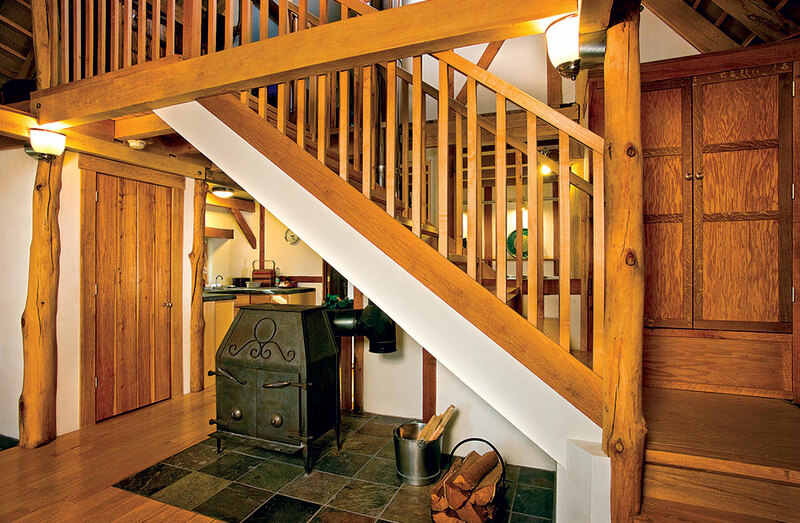 In the main living area, under the stairs to the loft, a wood-burning stove keeps the home warm throughout most days with a fire that burns from dinnertime to midnight. The only supplemental heat is a small electric heater in the bathroom. Opposite the sofa nook in the living room is an alcove for music. Because the straw bales vary the wall thickness from 18 to 24 inches, the windows have to be inset. 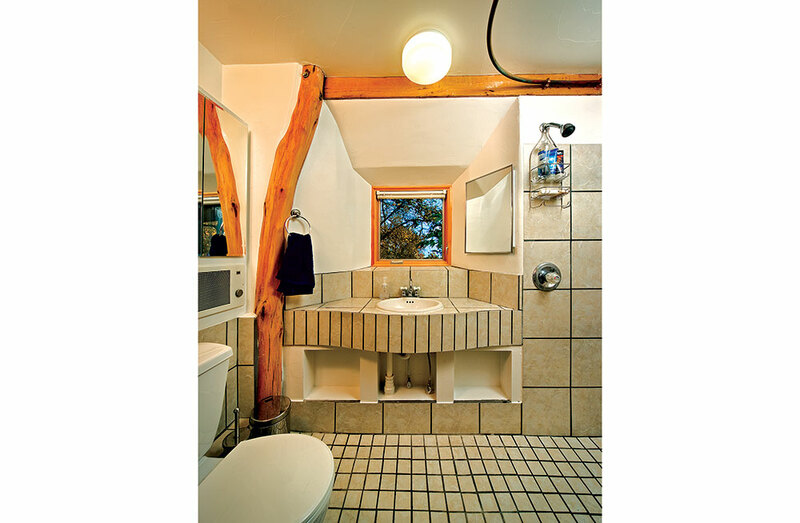 The bathroom is the only room in the house with supplemental heat beyond the wood-burning stove in the living area. Use of the small electric heater in the wall under the mirror on the left raises the monthly electric bill from $40 to $65 during the cold Indiana winter.